Sales of new single-family homes were at a seasonally adjusted annual rate of 512,000. This is 2.0 percent higher than January but 6.1 percent below the February 2015 estimate. The median sales price of new homes sold in February 2016 was $301,400; the average sales price was $348,900. The total U.S. loan delinquency rate was 4.45 percent, down 12.57 percent month-over-month and 15.93 percent year-over-year. The total foreclosure pre-sale inventory rate was 1.30 percent, down 0.64 percent month-over-month and 24.59 percent year-over-year. The total foreclosure starts were 84,300, up 17.25 percent month-over-month and 9.20 percent year-over-year. Mortgage applications decreased 3.3 percent week-over-week on a seasonally adjusted basis. The refinance share of mortgage activity decreased to 53.9 percent of total applications from 55.0 percent the previous week. The average contract interest rate for a 30-year fixed-rate mortgage with conforming loan balances decreased to 3.93 percent from 3.94 percent the previous week. The RESI decreased 4.4 percent from Q4 2015. Quarter over quarter, purchase market sentiment declined 4.2 percent. Refinance mortgage sentiment declined 4.9 percent quarter-over-quarter. 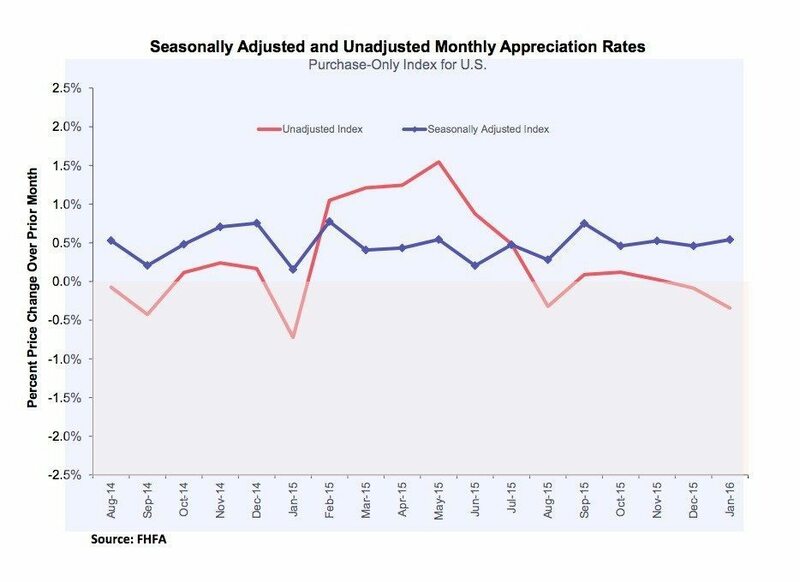 The home price index was up 0.5 percent nationally month-over-month on a seasonally adjusted basis for January 2016. The index was up 6.0 percent year-over-year. Monthly price changes ranged from -1.0 percent in the Middle Atlantic census division to 1.7 percent in the South Altantic census division.